Basilicata's tragically priceless position on the ancient Roman road, directly between Rome and its Byzantine empire, meant a forest of fortresses were built into the region's hillsides and cliffs. These were invaded and plundered repeatedly until the unification of Italy in 1861, when Basilicata became a bit politically irrelevant, and this region of dark forests and high mountains became a place where superstition flourished. If you're interested in the region's rich history, some of the best places to stay in Basilicata are Melfi, Venosa and Matera. This is where you'll find some of the most significant of Basilicata's Byzantian, Norman and Roman relics on display. In the north of the region wheat, olives and grapes are grown on gentle hills, and this rural area is a great choice for foodies with its wealth of local ingredients. Basilicata's mountains, the Lucanian Apennines, are familiar to hikers. Both for their challenging peaks and dense wooded valleys. If you're here to hike, some of the best places to stay in Basilicata are Pollino, Sila and Aspromonte. Our pick of the best places to stay in Basilicata range from high-end, celebrity-owned hideaways to architecturally stunning spots built into the cliffsides. Be sure to spend an afternoon wandering around the gorgeous Sassi di Matera caves. With wonderful views, a film museum showcasing the history of the area and underground churches, it's a great spot to spend a few hours. The Il Mirto Solarium Bar is a wonderful place to spend the afternoon. Swim in the crystal clear water, sunbathe on the long sandy beach and take in the lovely surrounding scenery. Volo dell'Angelo is an absolute must for adrenaline junkies! Hike up to the top before flying head first on a zip line between the mountains - a thrilling experience with jaw-dropping views. Try the wide range of wines on offer at Cantine del Notaio and learn all about the estate's viticultural process. Their friendly and knowledgeable staff will answer any question you may have. Matera is the best place to stay in Basilicata if you want to be near the region's star attraction. Matera itself is the attraction: a town so well built into the ravine that it looks organically formed. The town's cave-dwellings, called Sassi, are in, and below, the centre. The earliest Sassi were built by Byzantine and Benedictine monks for security, but their obvious success meant that farmers and other locals began fashioning them as homes as well. In 1993 the city, and its surrounding grotto towns, was declared a World Heritage Site. And, in 2003 this is where Mel Gibson filmed 'The Passion of the Christ'. 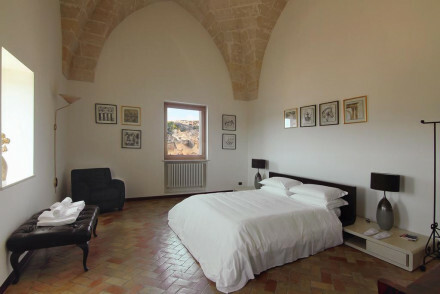 L'Hotel In Pietra, set in a wonderfully historic 13th century monastery, boasts enormous cavernous rooms with stone walls, great views and plenty of charm. An unforgettable stay and, with rooms starting from just £67, it's all at very decent value. The Palazzo Gattini is an elegant five star spa hotel with 20 comfortable, contemporary rooms, a rooftop pool and terrace and an excellent restaurant serving local specialities. Historic, chic and romantic. The Locanda di San Martino is a gorgeous hotel with 32 large rooms, with charming original features and beautiful antiques. There’s an indoor pool and excellent spa and Turkish baths. And of course splendid views. Le Grotte della Civita is one of the best places to stay in Basilicata if you're looking for a really unusual place to lay your head. Built into the sheer rock face, the hotel's 12 rooms and six suites lie in vaulted caves - so you sleep surrounded by lovely pale sandstone. If it sounds chilly don't worry, there are log fires and generous standalone bathtubs to keep you feeling cozy. And the views from the rock face balconies are fantastic. 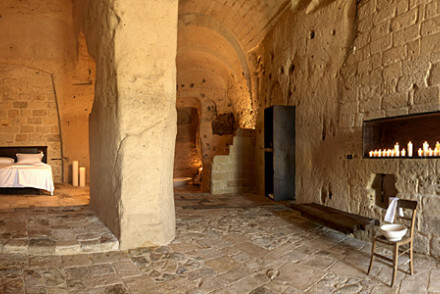 Sextanio Le Grotte Della Civita dates back to the prehistoric period and is in itself a UNESCO world heritage site! Carved into the hills, it offers incredibly romantic and cosy candlelit accommodation complete with statement baths. With rustic cuisine served up and superb views, it's a fantastic escape. Maratea is Basilicata's main coastal resort, and one of the best places to stay in Basilicata as far as tourist infrastructure is concerned. The medieval village of the old town is a charming contrast to the up-and-coming harbour. Indeed, many Italian holidaymakers have been won over. Coming in on the coastal road - which is even more narrow and winding than the Amalfi Coast Road - you can see the many hidden harbours and perfect sandy coves. Basilicata's other coast, on the Ionian Sea, is a better choice for those looking for ancient sites. Metaponto and Policoro, once parts of Magna Graecia, are on this coast. 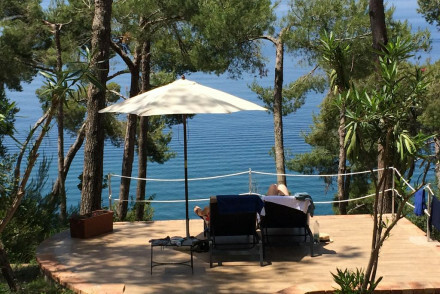 Villa Cheta is set in a picturesque rose and cream stuccoed 19th century villa with glorious vistas of the Mediterranean. This art nouveau spot offers charming traditional accommodation and lovely gardens, whilst you can also enjoy lovely meals out on the terrace. Santavenere Hotel is a 5* spot right by the sea, boasting its own private beach area. You'll adore their classically elegant rooms and if you don't fancy swimming in saltwater then there's an indoor and outdoor pool to choose from. Gourmet cuisine served up. A truly first-rate stay. La Locanda Delle Donne Monache, set in a converted 18th century convent, is a wonderfully charming spot. Perched atop a mountain with glorious views of the area, it offers contemporary yet unfussy accommodation, tranquil gardens and an outdoor pool. Enjoy terrific meals from the Il Sacello restaurant. Hotel Torre Fiore is a lovely boutique property set in a 16th century fort with rural surroundings. Featuring chic contemporary accommodation including large suites, there's a lovely infinity pool to relax by and a spoiling spa. What's more, you can even treat yourself to an in room massage if you want to feel completely rejuvenated. 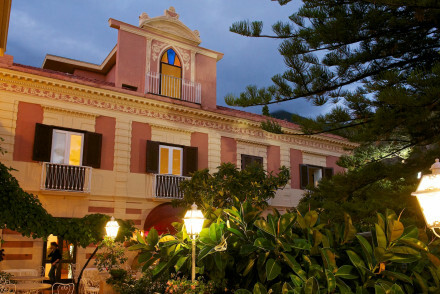 Palazzo Margherita is a truly fantastic spot located in the sleepy town of Bernalda. Owned by Francis Ford Coppola, it boasts a lovely range of suites with frescoes and large beds, as well as having a picturesque leafy courtyard in which to enjoy a good book. Scrummy locally sourced cuisine served up. Basilicata's obviously nicest in the summer months, with the average daily temperature rising to 23°C in July and August. Therefore, this is the nicest time of year to visit, though be warned that as it's peak season accommodation will be on the pricier side of things. There are no airports in the region, however visitors can fly into either Naples International Airport or Bari Airport. From the airports, take the bus into the centre of town and then the train on to your final destination in Basilicata. Browse though our list of all the best places to stay in Basilicata. 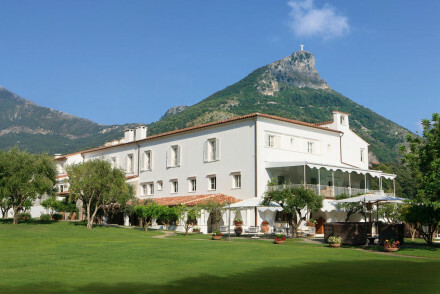 Expand your search to browse through the best places to stay in neighbouring Campania. 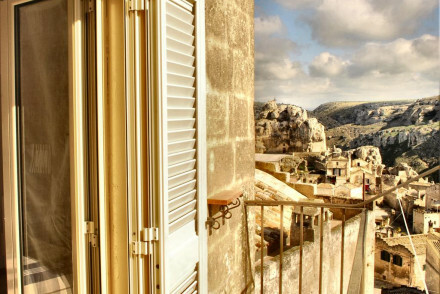 A small B&B set in a 19th century house in the historic quarter of Matera. 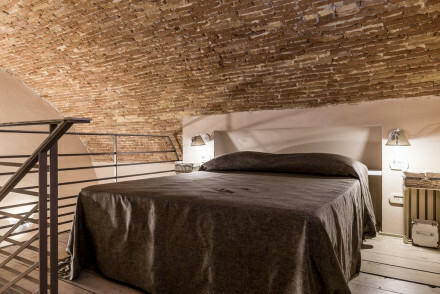 Rooms feature exposed stone walls, antique furniture, tunnelled rooms and soft hues; an effortless blend of minimalist decor and rustic charm. Guided tours and romantic dinners are on offer and the price is very attractive. 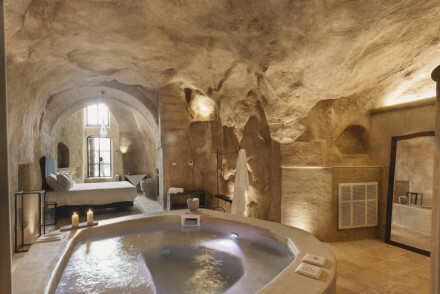 Romantic Break - The hotel organises romantic dinners inside a "sassi" cave for guests with locally-sourced cuisine. Sights nearby - Only 600 meters from the first prehistoric rock settlements in Matera. 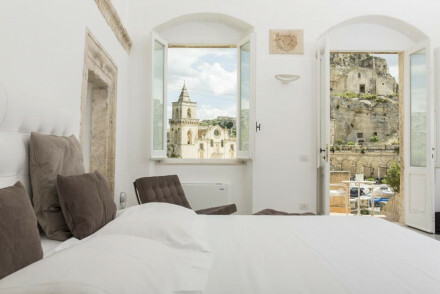 Charming B&B in the historic centre of Matera offering comfortable, contemporary rooms with breathtaking views of the Rock Churches. The rooms omit a warm ambience, with parquet flooring and marble-tiled bathrooms. Next to the Museum of Medieval Art and the Museo Archaeologico Nazionale Ridola. Local exploring - Well placed for exploring the ancient "sassi" dwellings of Matera, it is near many museums and has views of the Rock Churches. Sights nearby - Matera Cathedral is barely 0.3 miles away. Stylish hotel in Bernalda built out of old mills and workhouses. Marrying the past and present with exposed brick walls, antique furniture, lush modern bathrooms and vaulted ceilings with terracotta Roman tiles. Ideal for history lovers, only 45 mins from Matera. Local exploring - The ancient city of Matera is a European rarity: encased as if in a time warp, her houses have stood for thousands of years. Sights nearby - The sights and smells of Matera, still entombed in its ancient "sassi" cave dwellings, is a must-see. 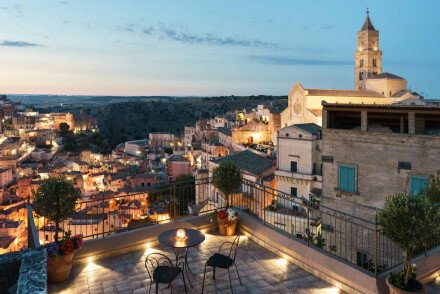 Stylish hotel in the historic centre of Matera offering five rooms, hewn from the rock, that combine rustic charm with contemporary comforts. Breakfast is served in a 13th century church and guided tours are organised for guests. Ideal for lovers of antiquity. Romantic Break - The suites, carved into the mountain rock, are soundproofed and one has a Turkish bath. Sights nearby - The Church of San Pietro Barisano and the Museum of Contemporary Sculpture are a 3 minute walk away. 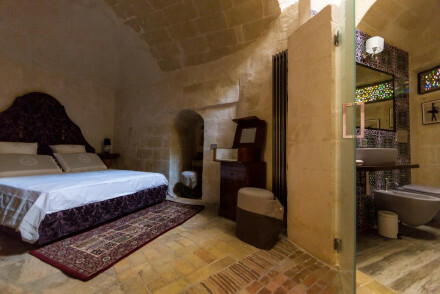 A monasterial boutique hotel with enormous rooms in Matera. Cavernous bedrooms and suites with vaulted ceilings, mezzanine levels, and stunning views over the town. Unusual and great value. Situated in off the beaten track Tursi, The Orangery Retreat boasts two separate apartments which have been renovated to provide an intimate stay. Both offer original features galore, accompanied by indulgent bathrooms and charming patios for whiling away the evenings. Rural bliss! With breathtaking views of the "sassi" dwellings of Matera, a stylish luxury B&B that combines rustic charm with modern comforts. Featuring terracotta floors, vaulted ceilings, artisan chairs and marble bathrooms, it omits a warm ambience. Ideal for guests wishing to explore Europe's oldest city. 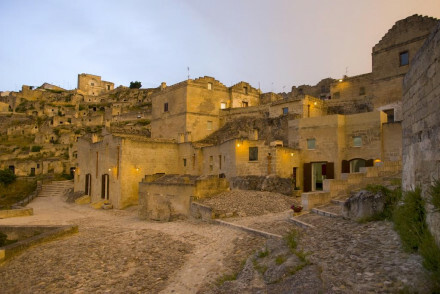 Local exploring - The B&B lies in the archaic Roman military settlement in Matera, one of the oldest quarters of the city. Sights nearby - Stroll down to the nearby Matera Cathedral and marvel at its stunning architecture. A stylish boutique hotel in the historic centre, offering en-suite rooms decorated in a minimalist fashion with marble floors, exposed stone walls and vaulted ceilings. Only 350 yards from Matera Cathedral, it is ideally placed for exploring the city and her famous "sassi" prehistoric houses. Local exploring - The "sassi" cave dwellings, carved into the mountain rock, have been inhabited for some 6000 years. Sights nearby - Stroll down to the majestic Matera Cathedral. 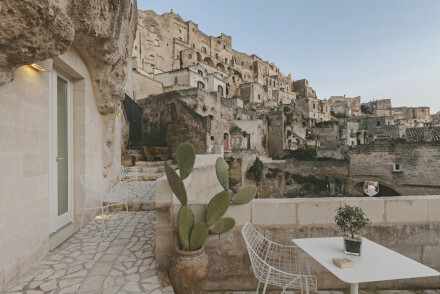 Stunning hotel in the heart of Matera, offering rooms and suites built out of the ancient cave dwellings of the "sassi". Only 5 minutes from the city centre, this is ideally placed for those hoping to explore Matera. The rooms are rustic-meets-minimalist, with antiques and exposed stone walls. Foodies - The hotel boasts a large wine cellar, many vintages are from its own winery. Local exploring - Well positioned to explore the historic city of Matera by foot. Sights nearby - Only a short walk from Matera Cathedral. 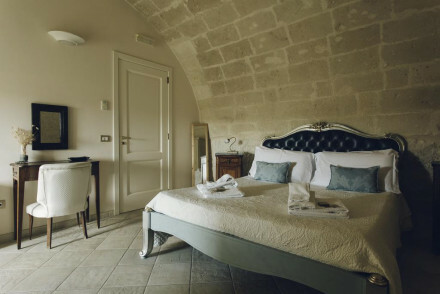 Elegant hotel in the heart of Matera, offering quirky and ornate rooms with tiled bathrooms, exposed stone walls, murals and antiques. Ideally positioned in the heart of the historic city. 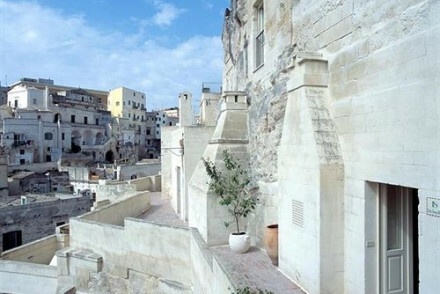 The hotel organises guided tours of Matera with an historian and sailing trips. Local exploring - The hotel organises guided tours of the Certosa of Padula with the historian Michele Rizzo. Sights nearby - Tramontano Castle. a splendid example of 15th century Lucanian architecture, is only 0.3 miles away. Sailing - Take one of the hotel's cruises on a beautiful sailing ship exclusively for guests. 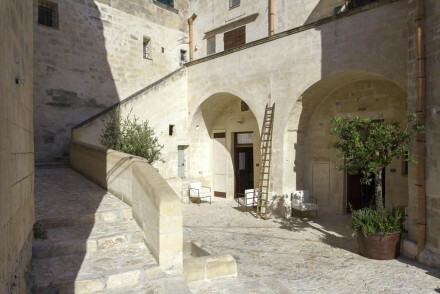 Designer hotel in the historic centre of Matera. 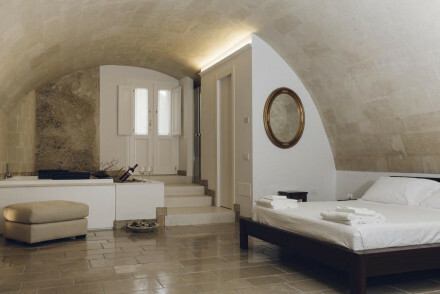 Rooms blend bright minimalist styles with the ancient traditions of the "sassi" houses. Red wooden furniture is set against carved white limestone walls and all rooms boast views over the prehistoric caves of Matera. Ideal for history lovers. Local exploring - The historic centre of Matera is one of the oldest cities in Europe and her very houses are sights worth seeing. Great walks - Matera is a city enshrined in a time warp, the archaic "sassi" cave dwellings have been inhabited for some 6000 years. Sights nearby - The hotel overlooks the prehistoric caves of the Chiese Rupestri Archaeological Park. In an immortal city carved into mountain stone, this is a hotel like no other. The rooms are restored cave dwellings built around an ancient courtyard and are ideal for those looking for a unique holiday experience. The rustic rooms have exposed stone and wooden furnishings. A serene and rare place. Local exploring - Located in an historic region there's plenty to discover nearby. Great walks - Walking through the old city of Matera is like stepping into a time machine, ancient chapels and forts dominate the skyline. Sights nearby - The Sassi houses have been inhabited for thousands of years and Matera is one of the world's oldest inhabited cities. Hotel with regal elegance but modern, minimalist sensibilities atop an ancient tower in the historic centre of Madera, offering suites with breathtaking balcony views of the city. With vaulted stone ceilings, antique chairs and murals on walls, suites come with a jacuzzi bath. Romantic Break - The suites come with a jacuzzi and a dinner of traditional Lucan cuisine can be prepared on the balcony. 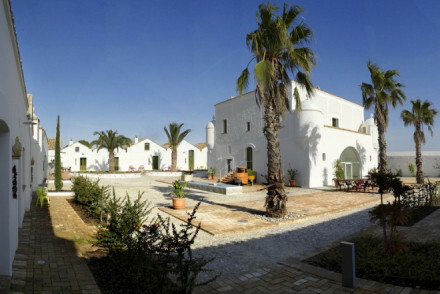 Delicious boutique hotel in the Bascilicata region of southern Italy. The Ionian sea can be glimpsed in the far distance. Family owned this 16th century fort has been lovingly restored and given a chic, contemporary makeover. Infinity pool, mouth-watering cuisine: the perfect romantic break. Sights nearby - There are many interesting villages and towns in the vicinity to discover. Elegant 5* spa hotel. Rooms have contemporary furniture, exposed stone walls, luxurious bathrooms and artworks. Rooftop pool, terrace, extensive spa. Excellent dishes from Basilicata in the restaurant. Historic, chic and romantic. 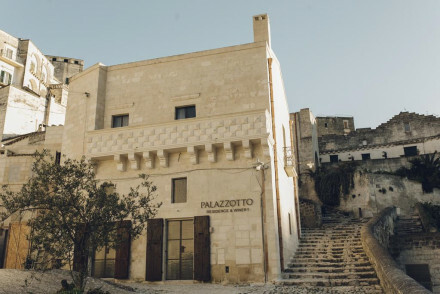 Elegant accommodation in the heart of Matera, offering en-suite rooms that seamlessly blend the rustic traditions of the "sassi" dwellings with modernity. There is a restaurant serving local cuisine, bar and massages on offer. Ideal for newly-weds or those looking to soak in the city's history. Romantic Break - The suites come with either a heated indoor pool or a jacuzzi. Swimming Pool - The suite Grottopignata has a small heated pool. Cooking classes - The restaurant offers cooking classes. Gorgeous hotel in the city. 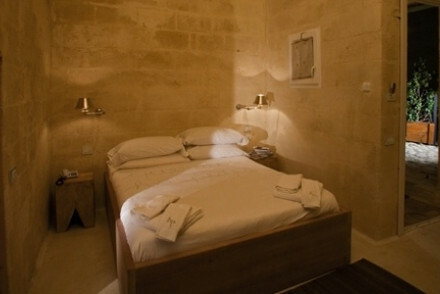 Rooms are large and decorated with antique furniture, original stone features and modern bathrooms. Indoor pool and excellent spa with Turkish baths. Atmospheric stay with lots of Italian romance and splendid views of the city. 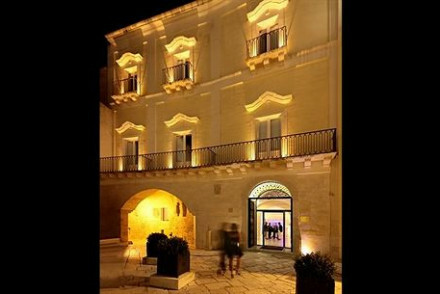 Gorgeous hotel in the historic centre of Matera, offering en-suite rooms which wed warm, rustic styles with minimalist decor. Expect tiled floors, colourful vintage furnishings and exposed stone walls. 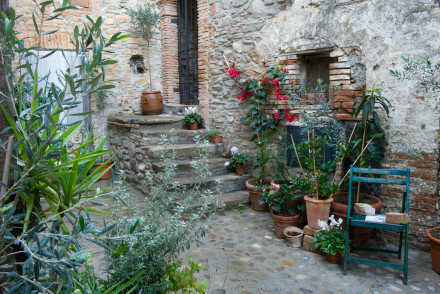 Rooms also boast delightful views of the "sassi" dwellings, and the suites come with a whirlpool. City Style - Book one of the chic suites boasting a whirlpool with chromotherapy features. Local exploring - Ideally positioned to explore Matera by foot. Sights nearby - At the foot of the Convent of Sant' Agostino, a former cloistered monastry. 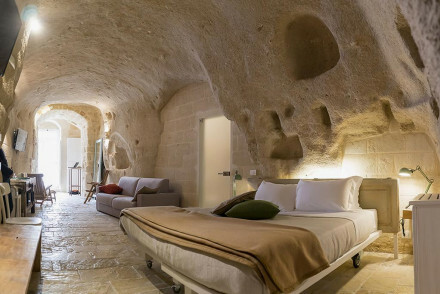 An intimate 5-star resort carved out into the mountain rock of Matera. Offering cosy, rustic yet modern, rooms completed with archaic furnishings and panoramic views of the historic centre. The restaurant serves excellent local cuisine. Ideal for those looking for a unique holiday. Local exploring - In the historic centre, Matera Cathedral and Tramontano Castle are a mere 3 minute walk away. Great walks - The hotel regularly organises walking tours around the city for guests. Cooking classes - Book a cooking class and learn how to make dishes of the region. A cave hotel with medieval romance in a magnificent hilltop setting. Very unusual rooms and suites with vaulted ceilings, sandstone walls, and standalone bathtubs with burning log fires. Delicious food, cooking lessons, and spectacular views. Definite wow factor for honeymooners or romantic breaks. Francis Ford Coppola's fifth hotel in the sleepy town of Bernalda. This rococo chic 19th century frescoed Palazzo has been given a magical makeover. Secluded courtyard, vine covered pergolas, lavender and rosemary beds, pool and private cinema complete the picture.